In February 2015, NHS organisations and local authorities in Greater Manchester signed a landmark devolution agreement with the government to take charge of health and social care spending and decisions in the city region. Greater Manchester Health and Social Care Partnership is responsible for the devolved £6 billion health and social care budget for Bolton, Bury, Oldham, Manchester, Rochdale, Salford, Stockport, Tameside, Trafford and Wigan. The partnership includes NHS organisations, councils, primary care, NHS England, community and voluntary social enterprise organisations, Healthwatch, Greater Manchester Police and the Greater Manchester Fire and Rescue Service. It includes ten hospitals with A&E departments and six urgent care centres and incorporates three new care model vanguards: Salford Together, Stockport Together, and Salford and Wigan Foundation Chain. It also includes The Christie NHS FT. The population of 2.8 million has an age structure similar to England as a whole, however Central, North and South Manchester and Salford have a higher proportion of people aged 20 to 34 years than the average across the area. 36.2 per cent of the population live in the most deprived areas of England. 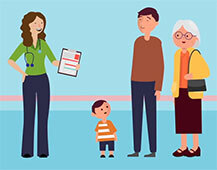 A high prevalence of long-term conditions means that people have a shorter life expectancy and can expect to experience poor health at a younger age. The partners want to deliver the greatest and fastest possible improvement in people’s health and wellbeing by creating a strong, safe and sustainable health and care system that is fit for the future. They believe that reform of health and social care is vital to improve the area’s productivity by helping more people to become fit for work, find jobs (or better jobs) and stay in work for longer. Reform of early years provision is key to increasing productivity of parents and, in the future, their children. 2,750 fewer people suffering serious falls, remaining independent at home for longer. Tameside is leading the way in the Greater Manchester region in using digital technology in health and social care. Staff in care homes now use Skype to get in touch with dedicated nurses at the local hospital when patients within the homes become unwell. The hospital nurses are able to provide expert advice and guidance through a video conversation over Skype. This support means that patients who would normally have been directed to A&E can remain comfortable in their own bed while staff receive advice on the right course of treatment or action to take.